Banksy’s Bethlehem hotel is offering a room with a view unlike any other, looking out onto the West Bank barrier separating Israel from the Palestinian territories. Opened to the media on Friday, the project’s organizers claim it will soon be open to the public for bookings. 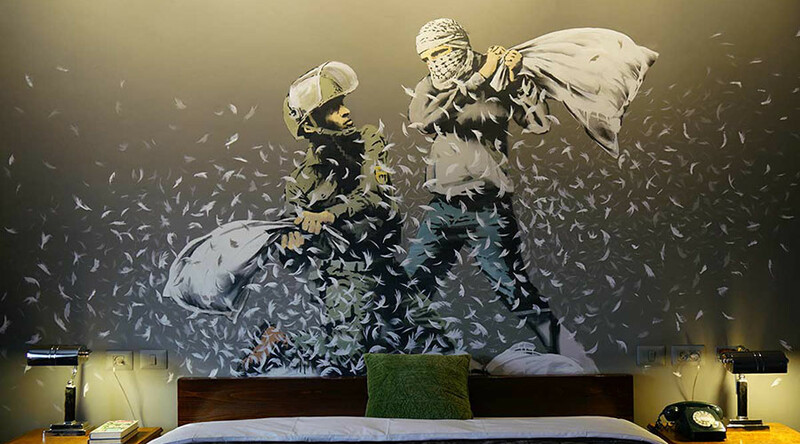 The ‘Walled Off Hotel’ is decorated in works from the anonymous British street artist, including a mural of a pillow fight between an Israeli soldier and a Palestinian, a monkey butler and a moving display depicting the signing of the Balfour Declaration. Work from Palestinian artists will also be displayed in the hotel, which boasts one room with a view of the West Bank barrier and an Israeli watchtower. The nine-room hotel was open to journalists on Friday, including Krishnan Guru Murthy who gave a tour of the premises on Facebook Live. The hotel’s manager told him that staff did not know of Banksy’s involvement until minutes before it opened. “This will create an industry that started in 2007 called Banksy tourism,” the manager said, claiming the hotel took 14 months to decorate and will be a permanent fixture. Banksy previously created art on the controversial West Bank wall including a dove in a flak jacket and a young girl frisking an Israeli soldier.